Common Uses of Prevacid (Lansoprazole): Prevacid (Lansoprazole) is a proton pump inhibitor (PPI) This medicine works by blocking acid production in the stomach. 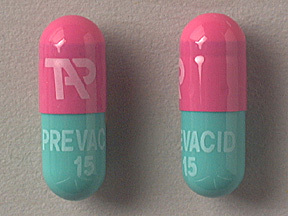 Prevacid (Lansoprazole) may be used in combination with antibiotics (e.g., amoxicillin, clarithromycin) to treat certain types of ulcers. Prevacid (Lansoprazole) may also be used to treat other conditions as determined by your doctor. How to use Common Uses of Prevacid (Lansoprazole): Follow the directions for using this medicine provided by your doctor. TAKE THIS MEDICINE in the morning unless your doctor directs otherwise. TAKE THIS MEDICINE before eating. SWALLOW WHOLE. Do not break, crush, or chew before swallowing. IF YOU HAVE TROUBLE SWALLOWING THE CAPSULE, the capsule may be opened and the contents sprinkled into soft food (e.g., applesauce, cottage cheese, yogurt), or emptied into a small amount (2 oz or 60 ml) of juice and taken as directed. Rinse the container with an additional small amount of juice and drink the contents to make sure the entire dose is taken. DO NOT CHEW the food/medication mixture or prepare a supply in advance. Doing so may destroy the drug and/or increase side effects. Potent acid-reducing medicines such as lansoprazole can decrease the effectiveness of sucralfate, as well as other drugs such as the antifungals ketoconazole and itraconazole. If instructed to take any of these medicines while taking lansoprazole, consult your doctor or pharmacist regarding the proper timing of each dose. For example, if you are instructed to take sucralfate in addition to lansoprazole, it is best to take the lansoprazole at least 30 minutes before your sucralfate. Use this medicine regularly in order to get the most benefit from it. To help you remember, use it at the same time each day. STORE THIS MEDICINE at room temperature between 59 and 86 degrees F (15 to 30 degrees C) away from light and moisture. Do not store in the bathroom. CONTINUE TAKING THIS MEDICINE even if you feel better. Do not miss any doses. IF YOU MISS A DOSE OF THIS MEDICINE, take it as soon as possible. If it is almost time for your next dose, skip the missed dose and go back to your regular dosing schedule. Do not take 2 doses at once.